Last week we finished one of the main objectives that we set ourselves a few years ago: to finish planting all the olive trees we had in mind. In total about 2,500 olive trees in 14ha to a plantation framework of 7x7 meters and 8x8 meters. Here you can see some articles that we have published about different ways of planting that we have used: traditional method and using GPS. Once the last planting phase was finished (around 1,000 olive trees), we performed the implantation irrigation. It is an irrigation that more than for the hydric needs in itself, it is really useful for the mechanical action of compaction and elimination of air in the subsoil helping the root to bind well to the soil. The dose of water we used was about 10 litres/olive tree. Perhaps a little low the amount of water used (an ideal dose would be about 40 litres/olive tree), but time constraints are often those that command. In this implantation irrigation we also take advantage to introduce phosphoric acid and humic acids that will undoubtedly help the main objective: not to lose any olive tree that has been planted and to have a rich soil around each olive. The next task after the implantation irrigation is to harrow using the cultivator in order to cover the soil that has been wet in the irrigation and thus avoid evaporation that may occur by the high temperatures that we are suffering during these days and take advantage to remove the furrow that has created the planting machine and thus have the field leveled. 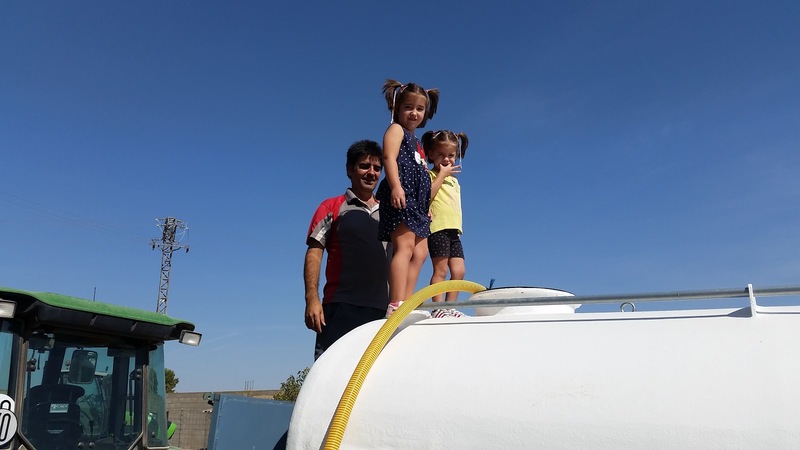 By the way, we were visited by the children of the house that are great fans of the olive tree and agricultural machinery in general... we spent a fantastic morning with them. In addition, another great moment for the memory was the lunch that we tasted in the Restaurant El Bodegón together with the personnel of the company "Los Mudis" (from Las Pedroñeras - Cuenca) agricultural services that have made us all the plantation of the olive tree with a great professionalism. Without a doubt, a very amusing working day!